Sophie likes reading about different personalities and she has a book selection. She enjoyed reading the Judy Moody books especially because she thinks everyone can recognize the kinds of moods Judy Moody gets into. 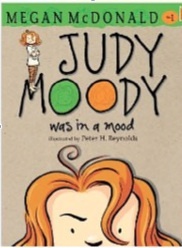 She told Hilda about the first book, Judy Moody was in a mood, by Megan McDonald with illustrations by Peter H. Reynolds when Hilda was steamed. That was because she missed watching the Olympics pole vaulting trials on TV while she was at the dentist having her teeth cleaned. 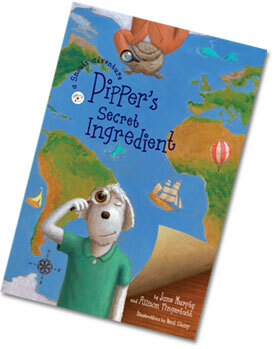 Read Amazon’s blurb here. “Judy Moody was in a mood. Not a good mood. 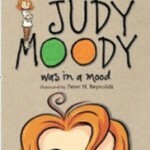 A mad-faced mood.” To start, Judy Moody doesn’t have high hopes for third grade. Her new desk won’t have an armadillo sticker with her name on it. her new classroom will not have a porcupine named Roger. And with her luck, she’ll get stuck sitting in the first row, where Mr. Todd will notice every time she tries to pass a note to her best friend, Rocky. An aspiring doctor, Judy does have a little brother who comes in handy for practicing medicine, a cool new pet, and a huge Band-Aid collection. Judy also has an abundance of individuality and attitude, and when Mr. Todd assigns a very special class project, she really gets a chance to express herself! Megan McDonald’s spirited text and Peter Reynold’s wry illustrations combine in a feisty, funny first chapter book for every kid who has ever felt a little out of sorts. Can you recommend a book selection about a character dealing with her or his emotions? Please share in our comments.